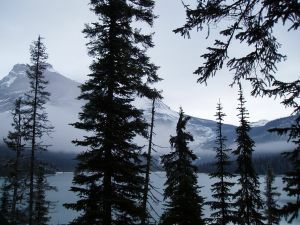 If you’re planning on visiting the Lake Louise area of the Canadian Rockies, you’re almost certain to be planning a visit to Lake Louise, the actual lake, because, well there’s a reason why they named the area after the lake. It’s truly a Rockies vacation must-see. Discover Lake Louise's other gem. But once you’ve had your fill of this blue-green (some say green-blue) lake, how about some emerald? Emerald Lake truly lives up to its name, with it’s deep, green color of both the lake and the surrounding forest. It’s a beautiful example of one of the more interesting natural processes that occur in the Canadian Rockies. The tallest peaks in Banff National Park capture weather that drifts in from the Pacific Ocean on it’s way east. But when the big clouds get hung up on the peaks they discharge their moisture down the slopes of the mountains. Where the water gathers, you get patches of coastal rainforest, quite different from the landscape elsewhere in the Rockies. Western red cedar trees and devil’s club, a large plant with thorns and maple-like leaves, are common in the rainforest patches. One of the most well-known such patches is the west side of Emerald Lake. It’s quite obvious to even the most casual observer, the great difference between the west side and east side of the lake. The vegetation, the water, the atmosphere; all of it points to the difference. There are interpretive signs posted around the lake to further explain it. But, of course, Emerald Lake is much more than an interesting quirk of weather. Down at the lakeshore, for example, you can also learn about the Burgess Shale, a quarry visible from the shore via a telescopic lens. An exhibit will tell you all about the fossils found in the quarry. Besides a guided tour you can take from the Burgess Shale Research Foundation, this is the closest you can get to the quarry. Come to the lake in late May or early June, when the snow is melting , and you’ll see spring flowers come into bloom. Bright yellow glacier lilies herald the coming of the new season. Hot pink calypso orchids come shortly thereafter. Emerald Lake Lodge is a great place for lunch or dinner, and there are many activities to try. All together, Emerald Lake is a worthy addition to any vacation in Lake Louise.